Communication in the backcountry is becoming a huge business, that is effecting huge businesses. 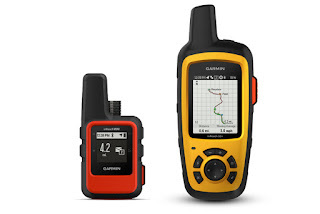 Garmin (The GPS company) purchased Delorme (the map company) just to get their hands on the Delorme inreach satellite communicators. That should be an indicator of the growth of this market. When I was a NOLS sea kayaking instructor we carried satellite phones for communications during an emergency. This would be the mid to late 2000's. To be polite about it, I would say this, they sucked. The audio quality wasn't great. They dropped calls all the time, they were heavy and expensive. But at the time they were the only game in town. For a lot of companies this is still the first choice for emergency communication in the backcountry. 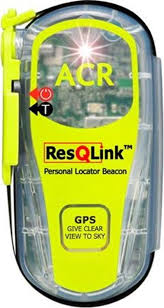 Another company, ACR (now ACR Artex) was a long time maker of EPIRB's. (Emergency position indicating radio beacons) These were most usually found on aircraft and ships at sea. Generally a bit bigger than a coffee can, they were one time use devices that you could either trigger manually or they would trigger automatically when they hit the water. They send a signal on 406 megahertz which is a frequency specifically used for world wide search and rescue. In the 1970's a group of major nations joined to gather and split the cost of putting satellites in orbit, solely for search and rescue. They would listen for signals on 406 mhz and transfer that signal back to earth, for the coordination of a rescue. These kinds of EPIRB devices would get rescuers within about a mile of you. Then they would have to use the Mark 1 eyeball to pinpoint your location. In the Early 2000's you only had two options, an EPIRB or a Sat phone, and for the casual outdoors person they were both horrible options. Then a little company released a new device. The SPOT. The SPOT device was inexpensive ($150) and you would have to pay for a service contract, also about $150 a year, but it was small, lightweight and powered by a pair of AA batteries. It was easy to use and a little irreverent, which sat phone companies and epirb companies certainly weren't. The box that the spot came in, said on it "by opening this box you guarantee you don't come home in one." Besides irreverence what made the SPOT different was it offered more options than what I call the "get me the hell out of here" button. It offered three options for communication. First, it offered an SOS feature that would send info via satellite to SPOT headquarters. It would show them where you are, and that you needed help and they would hand off your location and personal info to the appropriate authorities. Which is essentially what the ACR EPIRB's do, but SPOT doesn't use 406 mhz. They use a different system that is lower in power. But the Spot offered two other options. You could hit the OKAY button. Which would send an email or a text message to people on a preconfigured list. It would say something like, "this is where I am, everything is okay" and it would also send along a link to google maps showing your location. Finally there was a "help" option. This would send a message to a different preconfigured list of people, and it would say something like "Hey, I need help" and with the link to your location on google maps. But it doesn't notify the authorities. I think of this button as the "Hey, my car won't start button." In fact on the current device this has been renamed the SOV or Save our Vehicle button. SPOT was a huge step up in terms of cost and usability. But this opened the flood gates for this market space. Which bring us to where we are today. The current crop of satellite communicators has four competitors. 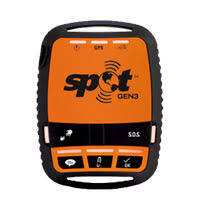 The first is the only one way communicator, the SPOT Gen3. ($149) plus a user subscription that starts at $149 a year, and you have to buy a year, you can't just buy a month of service for your big trip. It works like the device described above with a few more feature options around tacking your movements. Not that different than the original but smaller, lighter and more reliable. Next is the Garmin InReach Explorer+ 2 way satellite communicator. ($400), plus a user subscription that starts at $11.95 a month (but really gets usable at the next level which is $24.95 a month) It does everything the spot does, but when paired with a smart phone you can send custom text messages via satellite. You can receive weather reports via satellite, there are tracking features and it works as a full featured GPS for navigation. With this one you can purchase service by the month (but on the monthly "Freedom" plan, the costs are higher. But Garmin didn't rest on its laurels, they just released the InReach Mini ($350). It shares similar plans as its big brother and does everything its big brother does but in a much smaller package. It will also pair with Garmins high end watches like the Fenix 5. Spot didn't want to get left out in the cold, so it just released something new. The SPOT X 2 way satellite messenger. ($249.95) A bit bigger than the Spot Gen3 it has a built in keyboard that looks like an old school Blackberry. This gives you the ability to send custom text messages via satellite without having to pair it with another device like a smartphone or tablet. It too has a service plan that starts at $150. So which of these devices would I choose to take on my next adventure? The answer is obvious. None of them. I don't really need the two way communication. I have used a number of SPOT products and they work well enough. I know people that love their InReaches. But I don't really want that kind of contact in the backcountry. I go to the backcountry to avoid that kind of contact. But I do like the idea of the emergency rescue features. If the poo really hits the fan, I think it is a good idea to have an option. I would choose this. This option is a little different. It uses the 406 mhz signal of the older EPIRBS but adds a secondary signal at 121.5 mhz which brings rescuers right to you. It also provides a strobe so you can be found at night. More waterproof, and impact resistant than any of the other options we have discussed. The device is about $250 but doesn't have a user subscription. It also doesn't offer any communication other than the 'get me the hell out of here button.' No text messages, no okay messages, no my car won't start. Just call the cavalry, and get me out of here. But if that is the kind of device you are looking for there is no better. And that is what I would want. This effects us all, but if you work or play in the outdoors you are more effected than some others, for now. I am speaking about the state of our environment and how little our government in United States is doing. We used to be world leaders, and the current administration is reversing most (if not all) of what the last administration did. We, as enjoyers of the outdoors have to take up the slack. We need to be proactive about the way that we look after the planet. There is, after all no place else for us to go. If you think these aren't real issues, it is as simple as you aren't paying attention. Here is a list of 10 things you can do to help the environment. They are easy, and may seem like they couldn't help, but as part of a vast movement they will be. Plus, at the end, I have a one month challenge for you. #1 - Wash your clothes in cold water (you may need to use a cold water detergent). This is simple and will reduce your use of electricity. It has also been shown to actually clean your clothing better than in hot water. Simple to do, it will lower your electric bill, and decrease the amount of carbon being released (unless you are powered by renewables). For bonus points, ditch the drier. Hanging your clothes to dry outside will also use less (far less) electricity and actually extend the life of your clothes. It is the drier that shortens your clothings life, not the washer! You want proof? Check your lint trap. #2 - Be mindful about getting around. Avoid single person car trips, use mass transit, or bike commute, walk or run. This can also be as simple as making sure you can do multiple errands at once instead of making multiple trips. #3 - Avoid single use items. (This is one I struggle with!) Plastic spoons, forks and knives, and even containers from take out. They all get used for a few minutes and then end up in land fill. This can be as easy as packing your own multi-use utensils. If you are a backpacker you probably already have a spork you can use. Avoid the salad bar, and bring lunch. That way you aren't using take-out containers. Here is a very simple one. Just stop using straws. Just stop. There is nothing good about straws. #4 - Buy used items, or sell old items. Reduce, reuse and recycle. Everyone knows this saying, but few give it much thought to realize that reduce and reuse comes first. Simply buying used things or even selling your old things reduces the amount of things being created and things going into landfill. #5 - Eat less meat, particularly beef. Beef production is probably the single worst thing we do to our environment. They are responsible for more (far more) greenhouse gas emissions than cars or power plants. We cut down forests to have grazing land for more beef production which also removes trees which remove carbon dioxide. So it's a double whammy. This can be as simple as picking one day a week where you don't eat meat. This is how I started and it wasn't long before I was a vegetarian. This is the single biggest thing you can do to help the environment. #6 - Switch to LED light bulbs. You will use 75% less electricity, and they last 25 times longer. Easy. #7 - Buy local produce. This will help local farmers, and dramatically reduce the carbon impact of flying or trucking fruits and vegetables all over the planet. #8 - Use less water. Don't let the sink run, take shorter showers, don't water your lawn. And while we are at it, no bottled water. Buy a reusable water bottle. We know the water isn't any better than what is probably coming out of your tap, but plastic single use water bottles are a nightmare. People use a million water bottles a minute. A minute! For more info check out this. #9 and #10 go together. Let's do this challenge with Sailing LaVagabond. One month of no plastic bags, and no single use coffee cups. Use the #plasticfreewithslv or even #plasticfreewithPO. Post your pics to instagram. Lets see if we can turn one month into a lifetime. I really think that at some point we are going to see a global change int he way that we view the environment. I think there is going to be a seismic shift, and the world is going to come together and change dramatically the way we do things. There should be solar panels on every roof. Plastic bags and paper cups should be illegal. I hope that I live to see it, and it isn't too late to save our home. Right now, as people active in the outdoors we have to take a leadership role in this fight. We need beautiful places to work and play. Let's make everyone else play catchup. Lead the way! How Black Diamond Equipment forces change in the outdoor world. Black Diamond equipment has a knack for shaking things up. A talent for it. I'll explain, but first, a little history. Black Diamond equipment was originally Chouinard Equipment. It was founded by Yvon Chouinard who also founded Patagonia Clothing. In the 80's he owned both companies, and then someone died. A climber on the Grand Teton stopped to take a leak, and when he was done he didn't rebuckle his harness correctly. The guide - an amazing climber named Jim Bridwell - wasn't in a position to see it. He didn't know the guy stopped to take a leak and didn't know his harness wasn't secured properly. When the climber leaned back and weighted his harness, it unbuckled and he tragically fell to his death. The lawsuit that followed cost Chouinard ownership of Black Diamond equipment. It also changed the way climbing harnesses buckle, and the way people tie into them, but that is a story for another day. Chouinard sold Black Diamond to its employees, essentially it transitioned to an employee owned company and that was when things started to change. The first target on their list was Petzl, a French owned climbing and caving equipment company. The two companies were already competitors, but it wasn't climbing gear that Black Diamond decided to go after. It was something new for them. Headlamps. I remember in the early 90's descending the back side of Mt Washington in New Hampshire in the dark with a full pack over rough terrain. I had a pair of maglight flashlights, the two people I was hiking with had early Petzl headlamps. They had use of their hands and I didn't. I vowed I would never use a flashlight again, and I have never hiked with one since then. Petzl brought the headlamp to the United States from France and for quite some time they owned the market. I can't say for sure, but I suspect the headlamp for climbers, campers and backpackers comes from caving. Black Diamond saw an opportunity and entered the headlamp market, and they quickly took it over. Offering brighter headlamps at lower prices. Headlamp brightness used to be measured in watts - which I can tell you from experience is how most industries measure brightness, by the watts the bulb is using. This is how the photography and film industry historically measured brightness in lamps. Petzl was the first to switch to Lumens (which has its flaws as a measuring unit for brightness) and I suspect they did it so they could be measured on a different scale than the ever more powerful watt rating on a competing Black Diamond headlamp. Black Diamond switched not that long after Petzl did. We have been living in the "lumen wars" every since. Every six months or so Petzl will update the brightness of its headlamps and a couple of months later Black Diamond will do the same. Price points generally stay the same but light output jumps and Petzl always ends up just behind Black Diamond. For example the Black Diamond Spot and Petzl Actik are both 300 lumens and the Spot is $10 less. For example, to use the Black Diamond Spot as an example again - it is a super popular headlamp - Three or four years ago the Spot was only 40 lumens, compared to the 300 lumens it is today. It simply just kept doubling every year or so. But I can tell you from experience, 300 lumens around camp is a lot of light. If you are talking with people while wearing a headlamp, at that brightness it needs to be dimmer, or pointed at the ground or both. Black Diamond wasn't content to be slapping around Petzl though. They decided to go after another company that owned a market space. That company was Leki, makers of trekking poles. Black Diamond recognized the inherent problem with the internal twist lock used on trekking poles. The internal lock was simple, as you twisted it, the sides of the lock expand, pushing against the inside of the pole. This worked great, until it didn't. Admittedly, they are easy to fix, but you have to have the gumption to forcefully yank the pole apart, and do that without losing any parts. Black Diamond pioneered the external flick lock, which while heavier and more prone to snagging things on the trail they were far less likely to malfunction, and far more secure. The rest of the industry eventually switched to similar locking mechanisms, but it was too late. BD took over the trekking pole market. Then BD kicked it up another notch. They released folding poles with a cable running through the middle. They packed small and light, and once again the industry is playing catch up with Black Diamond. You have to wonder, what does Black Diamond have its sights on next? They have a proven track record for both innovation and being able to pull off practical gear. They are a company that I watch just to see what they are going to do next. Innovation is in their DNA. The company was founded by a man who was able to both envision how things should be and the gumption to make it happen. Chouinard reinvented piton manufacturing, and then created the concept of clean climbing (using protection that is removable from the rock without damaging the rock or the gear.) Yvon Chouinard also revolutionized climbing techniques. Literally changing the way we climb. What will Black Diamond come up with next? A venue where I would like to see them move is backpacking. They already make packs but they are usually climbing or skiing specific. If they brought there level of innovation to backpacking packs, they could give osprey a run for their money. Personally, I wish they would get into the kayak business. 1) No crowds. You want a taste of real wilderness without having to travel across the globe? There are far fewer people kayak camping than there are backpacking. The A.T. has seen 155% growth in the past couple of years. Backcountry campsites are full. So many people are hiking and backpacking that LNT.org is recommending that people put rubber tips on their trekking poles to prevent damage to trails. As a kayaker you will have campsites to yourself. 2) You already have the gear. Yes, you need a boat and paddle and pfd, but other than adding some dry bags (and there are even ways around this!) you are good to go. Just about any backpack is smaller than the storage of any kayak. All of your backpacking and camping gear will transition nicely to kayak camping. 3) Ready for adventure? You are used to walking on a trail, that even in the worst rain is usually predictable (with the occasional mudslide not withstanding). Transition to the water makes everything a little more exciting. Adventure awaits. 4) Float and gloat. This is the reason I transitioned to kayaking. I was tired of carrying a heavy pack. In the early 90's my pack weight was 52 pounds, and at the time it couldn't really get any lighter than that. I used an 85 liter pack. Today I am using a 48 liter pack and my pack weight is 32 pounds with real food (not freeze dried.) But in a kayak I just have to get my gear to the water line, I am making distance without carrying any gear on my back. I can also go further, the max for a backpacker is about ten days of food and fuel, and even then the load is monstrously heavy. I kayaked 21 days on the Inside Passage (though we had food and fuel for 30!) and it all fit easily in my Kayak. The boat was a little slower, but actually more stable when loaded. How big is your backpack? 65 liters? My boat can hold a little more than 215 liters of gear, and more importantly, none of it is on my back! 5) The food is better! When weight isn't an issue I can eat whatever I want for dinner. I generally make pasta with a sauce from scratch. I don't have the skills, but I know people who bake in the backcountry. Which can be cakes, or pizza from scratch. And let's not kid around, you want a glass of wine with dinner, pack in a bottle. It will fit perfectly in the bow of your boat! 6) Big, exciting, epic trips are closer. It is far easier to do an epic trip in a kayak. A week of paddling on the NC coast where you see dolphins and not another soul is easy to make happen. Similarly - also in NC you could hike the Grayson highlands where you will see wild ponies - or as I call them, land dolphins! - but you will do it with a crowd of people around you. I think the path from novice paddler to extended trip is shorter in a kayak than it is in the backpacking world. 7) It'll make you cool. All your friends are backpacking. (and you can still backpack with them!) but you can also be the person that goes on amazing paddling trips. Far fewer people are doing kayak trips, so you will stand out in a crowd. 8) A different perspective of the world. When I am backpacking I feel like I spend the day looking at the ground, three feet in front of me. I have to think about taking time to look at the view. But in a kayak you are paddling while looking up and all around you at all times. 9) It will push your skills as an outdoors person. You will learn about water and tides and more about weather and wind and rain. It will kick your navigation skills to the next level and lets not forget that you get to learn all about propelling and controlling a kayak. 10) It's easier on achy knees and problematic backs. If you think kayaking is a sport of arm power you have never been taught how to paddle a kayak. Kayaking is at first about core strength, and eventually with practice and skill about leg strength. That is where the real speed in a kayak comes from. What kayaking will give you is amazing core strength and good posture. All without straining your tired knees. If you have back problems, make sure to support your back in the beginning, but soon you won't need the additional help. Think of Kayaking as cross training. 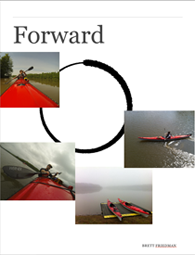 Your backpacking workout is very "legs and lungs" but kayaking is back and core. The Appalachian Trail. The AT. 2200 miles of history. I have a fairly good personal history with this trail, as does every hiker on the east coast worth his salt. I've hiked most of the trail from the New York State line heading north. Since moving to the south I have also hiked a lot of the trail down here, though I am not hiking as much as I did in the 80's and 90's. You may recall that last year I hiked the first 25 miles of the trail, I had seen the northern terminus and wanted to see the southern terminus. I wasn't disappointed, as it was a spectacularly beautiful hike. So it may surprise you to hear that I think the A.T. as we know it, is dead or dying. I have had this conversation with a friend who is also an outdoor educator, he has hiked the entire trail and he vehemently disagrees with me, so I may have the minority opinion, but that doesn't mean I don't get to express it. Between 2010 and 2017 the number of people attempting to thru hike the trail went up by 155%, but the number of people completing the entire trail is dropping. We don't know how many people use the trail for a couple of days, a weekend or a week, but the number has to be in hundreds every weekend. This is a huge impact on the trail and the surrounding environment. On my three day weekend, from the start of the trail we were constantly flip flopping with between 30 and 40 thru hikers. Upon getting to a shelter it was a party like atmosphere. There were just so many people. This impact, at some point is going to have to be dealt with. The Pacific Crest trail deals with it's growing popularity by making people get a permit to get on the trail. The A.T. is going to have to - at some point - do the same thing. According to the ATC on average you cross a road every 4 miles. I know this is an average and in practicality they are further apart than that, but you are never very far from a road, and therefore a town. Which means there will only be more people, vendors, stores and resources for hikers encroaching on the trail. Okay, here is the sentence that is going to piss people off. In my opinion -and it is a minority opinion I know - the Appalachian Trail barely counts as "wilderness." For me, a wilderness experience includes some measure of solitude and lack of access to resources. But hey, that is just my definition, let's see what Websters has to say. Uh huh... Does that sound like the Appalachian Trail to you? I spent three days on the start of the AT (keeping in mind I haven't hiked the whole trail, probably a third of it, but I have hiked thousands of miles all over the planet, I am not a neophyte hiker, okay?) and in those three days do you know how much wildlife I saw? One snake. I didn't see so much as a cool bird. I didn't see a squirrel. I didn't see a chipmunk. I had better odds of getting athletes foot than seeing a bear. The reason I didn't see any wildlife was the amount of people on the trail. That isn't to say it isn't a beautiful trail, it absolutely is. but as far as I am concerned it isn't wilderness. I am seeing more and more people - literally helping to outfit them - prepping for the Pacific Crest trail. This year I helped four, which doesn't sound like much, but is a 400% increase from any other year I have been doing this. I am also seeing a lot of thru hikers. A LOT! I think there is a social aspect to hiking the trail. Getting a trail name, and the like. I think it is becoming a club. A club that to get into it you have to hike 2000 miles. And I am not trying to diminish the achievement of completing a thru hike. It is an amazing achievement. A friend of mine is currently hiking the trail, but she is taking a break to go hiking in Alaska with her boyfriend. I am curious how she compares the two. We have to take steps, including a permit process, to lessen the impacts on the trail and protect it for future generations, but I fear it is in the beginning phases of the process of becoming a theme park. Like Philmont Scout ranch. There, now two groups of people can hate on me. Thru hikers and the Boy Scouts. Have at it. 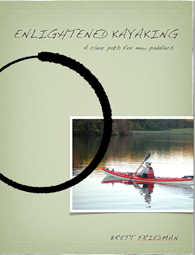 On Monday you can come back here to read about why you should transition to kayak camping. 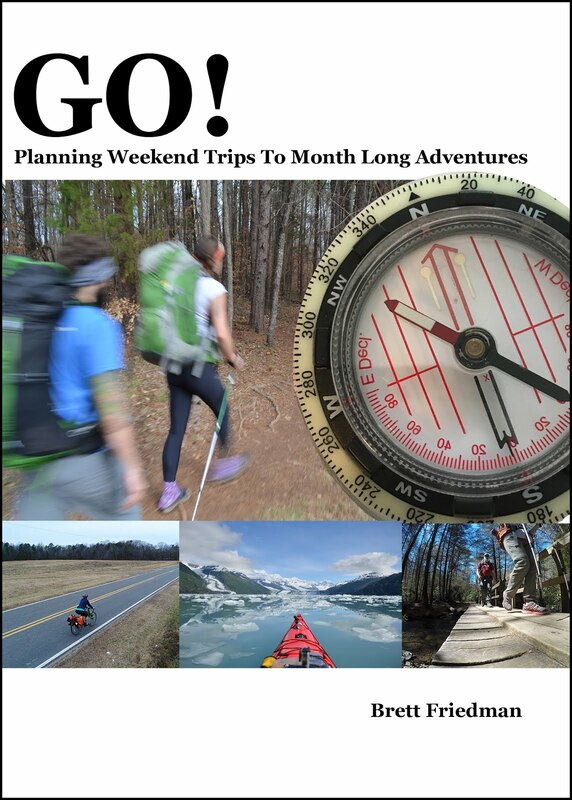 This edition of Pack and Go! or Hell No! is debating the jetboil Jet Gauge. 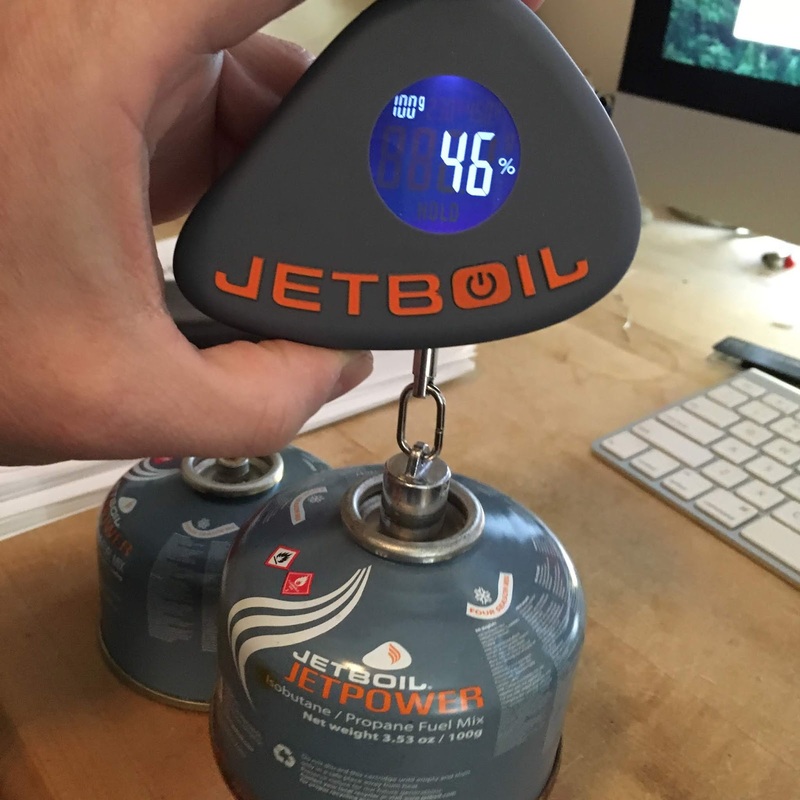 This product made by Jetboil is a a small battery operated scale for measuring the amount of fuel remaining in a single use fuel canister. Fuel canisters are by far the most popular fuel type used by backpackers and other outdoors people, but they have some inherent flaws. As I mentioned above they are single use. They can't be refilled, and without a special tool - the crunchit tool, also made by Jetboil - they can't be recycled. But they offer easy use, and great flame control. But, there is no way to a actually know how much fuel is in a partially used canister. Yes, there are a couple of methods for estimating the remaining fuel, but none of them are particularly accurate. That is where the Jet Gauge comes in. Screw the canister onto the bottom of the gauge, turn it on, and allow the canister to hang. It can be set to work with any of the three available sizes of canister and despite the fact that it is made by jetboil it will work with any brand of isobutane fuel canister. Due to the types of courses I teach I end up with a bunch of half used canisters, and no way to know how much fuel is in them. One test of the Jet gauge and I was sold, and at $14.95 I felt that it was a steal. The jetboil jet gauge is inexpensive and fixes a problem in the market. The Pluses - Easy to use, fills a hole in the gear world. Inexpensive. I can finally figure out how much fuel is left in a canister. The Minuses - Um.... I don't actually have any. I love this product. UPDATE: I just learned that this is a Backpacker Magazine 2018 editors choice product. So I am not alone in my love of this simple, and usable, piece of gear.